“Haha I got my Atma in one fate!” – You. “Haha, 200 fates and no Atma!” – You. This page details the process to upgrade your currently owned zenith relic to an atma relic. (IE: Thyrus Zenith to Thyrus Atma) Lost? You might be looking for the previous step Base/Zenith, or the next step Animus. Okay, before your expectations for an epic quest rise here, I’m going right ahead and saying that this step involves Fate grinding. Yeahp! You have to collect 12 different Atmas, from 12 different maps. They are dropped with a low drop rate from Fates in that region (Sample item: Atma of the Ram). Okay – so where and how? Can I Fate grind with any class and get atma? No, sadly. You have to use your class while your Zenith is equipped. Can I use another weapon while trying to get atmas? No, in case you missed the above. Do I have to get gold for atmas to drop? No, any level of fate COMPLETION gets it. Don’t ever farm two of the same Atma: It happens to the best of us. Please do yourself a favor and re-check the table above so you wont waste time. Spiritbonding? Sadly, it’s kinda hard to gain value from this step of relic. With the wildly varying levels in each zone, it’s impractical to attempt spiritbonding. Tag an go: It might seem rude, but if your goal is getting Atmas, you just need to hit/kill a single fate creep and proceed to the next. Please don’t be an a$$, though, and complete fates when you’re not especially pressed for time. 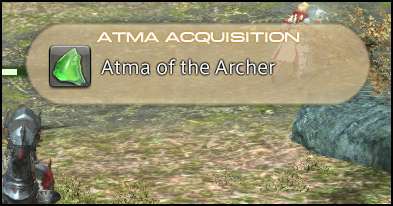 May the god of RNG be with you in getting your Atma Relic! I assume you’re going to be checking the Animus step next. Any tips or info to share? feel free to comment below!